Uglyworld #368 - Wedgehead Likes Light Painting (60-365), originally uploaded by www.bazpics.com. 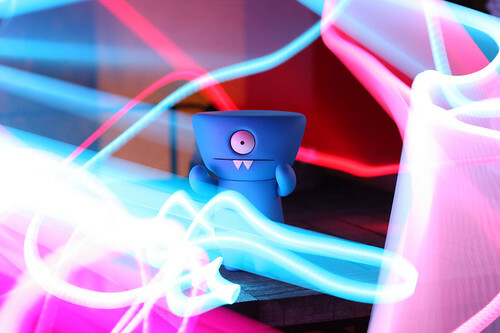 For those of you who've been visiting my stream since before I got addicted to the little guys who dominate it these days you'll already know that I used to like dabbling in the art of light painting (something I really need to get out and do more of as it's been ages). Wedgehead had been browsing through some of my photographs on the main PC at home and had been somewhat amazed at the light trail photo's I had taken over the past few years, so much so that he asked if I could show him how it was done. Of course I said yes as it meant I could unpack the light stick for the first time since last year, to say Wedgehead was completely intoxicated by the light as it danced all around him would be an understatement and a half, he loved it so much that I had to dance around with the light stick for over half an hour until he finally realised I was getting tired and said it was ok to stop for now (but that he wanted to have another demonstration another time soon). It was great fun, but now it's time to relax on the couch and let him admire his cool light stick pics for the rest of the evening. Wow this is sooo cool how did you do that? Maybe I too need to be addicted to light paining?